If you want live prices, you need real-time Level 1 data. This typically displays the highest bid price, the lowest offer price and the volume available for trading at each. For example, we might be told that there are buyers willing to take 13,000 shares of stock at a price of 130.5p and and sellers with 24,000 shares available at a price of 131p. You can watch this change in real time for every stock in your screen. The screenshot below shows an example live Level 1 data screen for Singapore-listed stocks on OCBC’s trading platform (it’s been edited to remove some extra columns where the dotted line is). 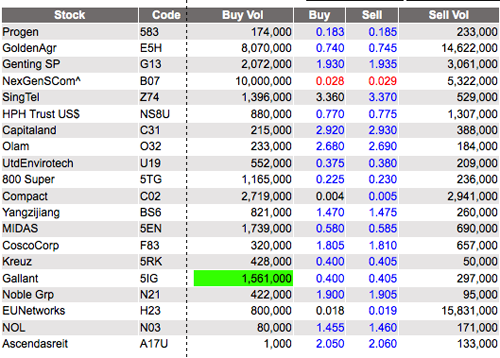 For each stock, you can see the best bid, the best offer and the volume available at each price. The cost of live Level 1 data varies between exchanges, but is now typically not very expensive. For example, the London Stock Exchange charges £0.02 per user per month to clients who have more than 15,000 users. Hence brokers in many countries now provide at least some Level 1 data for free because the added cost per client is minimal. Level 2 data is much more detailed. It displays not just the best bid and offer, and the volumes available for them, but the other top bids and offers in the exchange’s electronic order book. So on one side of the screen, it will show a list of bid prices and on the other a list of offer prices. So to continue the example above, we might see on the bid side that there are buyers for 10,000 shares at 130.3p and for 21,000 shares at 130p. And on the offer side, there are sellers with 38,000 available at 131.1p and 5,000 available at 131.5p. These quotes will mostly be anonymous – ie there is no indication who the potential seller or buyer is. But in markets that use market makers for liquidity, the market makers quotes will usually be identified – either generally as a market maker quote or tagged with the identity of the specific market maker responsible. The exact number of quotes displayed varies by exchange. Some will only show the top five positions in the order book, while others – notably Nasdaq – will allow you to see the entire order book. 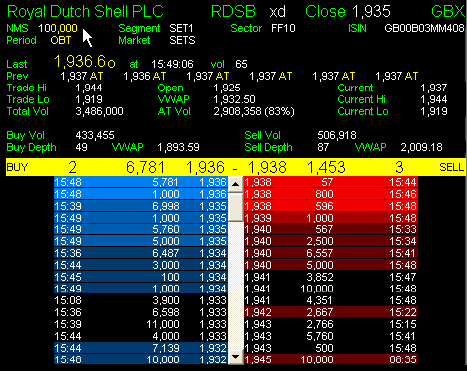 The screenshot below shows a example Level 2 screen for Royal Dutch Shell on UK data provider Sharescope’s platform. On the left you can see bids and the total volume at each bid price. On the right, you can see offers and the total volume available at each offer price. The yellow strip at the top shows the highest bid and lowest offer, which make up the prevailing market price. For active traders, live Level 2 data can be extremely useful. Being able to see the order book allows you to judge the balance between supply and demand before trading or decide where to place a stop loss. For this reason, it’s obviously much more valuable than Level 1 data and a real-time Level 2 data feed is correspondingly more expensive (even delayed Level 2 data is sometimes an extra charge). Live London Stock Exchange Level 2 is typically £20-50 per month through most providers. However, many brokers will waive the fee if you make a minimum number of trades per month. You don’t have to subscribe to data feeds through your broker – it’s also possible to buy them separately through specialist data providers. This may often be a better choice. Third-party providers often have better interfaces or add value through extra analysis or better tools, although you will often pay more for these. They may also offer live Level 2 data for markets that your broker doesn’t, even if the broker offers those markets for trading. Is Level 2 data worth the price to most users? Not really. Obviously, it’s vital for very short-term, high-turnover traders. But for longer term investors – and even for those who hold trades over days rather than minutes or hours – this kind of information is pretty much irrelevant. Any marginal improvements in price you might be able to get from being able to view the order book will be swallowed up by the Level 2 fees. Good company fundamental information and research will be more useful than up-to-the-second prices in the long run.